For other scripts that have been used to write the Persian language, see Persian language § Orthography. The Persian alphabet (Persian: الفبای فارسی‎, alefbā-ye fârsi), is a writing system used for the Persian language. The Persian script is mostly but not exclusively right-to-left; mathematical expressions, numeric dates and numbers bearing units are embedded from left to right. The script is cursive, meaning most letters in a word connect to each other; when they are typed, contemporary word processors automatically join adjacent letterforms. The modified change of the Pahlavi scripts to the Persian alphabet to write the Persian language was done by the Tahirid dynasty in 9th-century Greater Khorasan. Below are the 32 letters of the modern Persian alphabet. Since the script is cursive, the appearance of a letter changes depending on its position: isolated, initial (joined on the left), medial (joined on both sides) and final (joined on the right) of a word. The names of the letter are mostly the ones used in Arabic except for the Persian pronunciation. The only ambiguous name is he, which is used for both ح and ه. For clarification, they are often called ḥâ-ye ḥotti or ḥä-ye jimi (literally "jim-like ḥe" after jim, the name for the letter ج that uses the same base form) and hâ-ye havvaz or hâ-ye do-češm (literally "two-eyed he", after the contextual middle letterform ـهـ), respectively. Seven letters (و, ژ, ز, ر, ذ, د, ا) do not connect to a following letter, unlike the rest of the letters of the alphabet. The seven letters have the same form in isolated and initial position and a second form in medial and final position. For example, when the letter ا alef is at the beginning of a word such as اینجا injâ ("here"), the same form is used as in an isolated alef. In the case of امروز emruz ("today"), the letter ر re takes the final form and the letter و vâv takes the isolated form, but they are in the middle of the word, and ز also has its isolated form, but it occurs at the end of the word. Persian script has adopted a subset of Arabic diacritics: zebar /æ/ (fatḥah in Arabic), zir /e/ (kasrah in Arabic), and piš /ou̯/ or /o/ (ḍammah in Arabic, pronounced zamme in Western Persian), tanwīne nasb /æn/ and šaddah (gemination). Other Arabic diacritics may be seen in Arabic loanwords. Of the four Arabic short vowels, the Persian language has adopted the following three. The last one, sukūn, is not adopted. In Iranian Persian, none of these short vowels may be the initial or final grapheme in an isolated word, although they may appear in the final position as an inflection, when the word is part of a noun group. In a word that starts with a vowel, the first grapheme is a silent alef which carries the short vowel, e.g. اُمید (omid, meaning "hope"). In a word that ends with a vowel, letters ع‎, ه‎ and و respectively become the proxy letters for zebar, zir and piš, e.g. نو (now, meaning "new") or بسته (bast-e, meaning "package"). ٍِ تنوین جَرْرْ Tanvine jarr Never used in the Persian language. The following are not actual letters but different orthographical shapes for letters, a ligature in the case of the lâm alef. As to ﺀ (hamza), it has only one graphic since it is never tied to a preceding or following letter. However, it is sometimes 'seated' on a vâv, ye or alef, and in that case, the seat behaves like an ordinary vâv, ye or alef respectively. Technically, hamza is not a letter but a diacritic. alef madde â [ɒ] U+0622 ـآ — آ آ The final form is very rare and is freely replaced with ordinary alef. he ye -eye or -eyeh [eje] U+06C0 ـۀ — — ۀ Validity of this form depends on region and dialect. Some may use the three-letter ـه‌ی combination instead. Although at first glance, they may seem similar, there are many differences in the way the different languages use the alphabets. For example, similar words are written differently in Persian and Arabic, as they are used differently. The Persian alphabet adds four letters to the Arabic alphabet: /p/, /ɡ/, /t͡ʃ/ (ch in chair), /ʒ/ (s in measure). The shapes of the Persian digits four (۴), five (۵), and six (۶) are different from the shapes used in Arabic and the other numbers have different codepoints. Typically, words are separated from each other by a space. Certain morphemes (such as the plural ending '-hâ'), however, are written without a space. On a computer, they are separated from the word using the zero-width non-joiner. ^ Ira M. Lapidus (2012). Islamic Societies to the Nineteenth Century: A Global History. Cambridge University Press. pp. 256–. ISBN 978-0-521-51441-5. ^ Ira M. Lapidus (2002). A History of Islamic Societies. Cambridge University Press. pp. 127–. ISBN 978-0-521-77933-3. ^ "ویژگى‌هاى خطّ فارسى". Academy of Persian Language and Literature. ^ "??" (PDF). Persianacademy.ir. Retrieved 2015-09-05. ^ "Unicode Characters in the 'Number, Decimal Digit' Category". 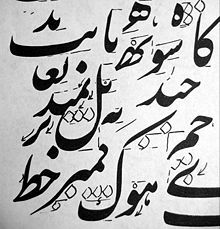 Wikimedia Commons has media related to Persian alphabet.